If you would like to view our storage facilities before making a reservation, come visit us today! Our storage facility is located at the intersection of E. Fire Tower Road and Bayswater Road, close to the Firetower Animal Clinic and Lemongrass Thai. 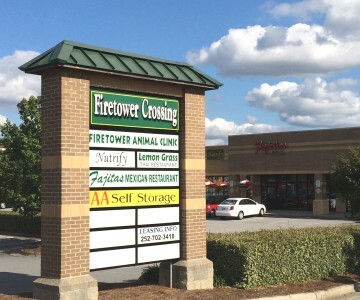 Click here for directions to our Greenville location. Like what you see? To reserve self storage and more, contact us at (252)756-6655 today and trust AA Self Storage to secure your stored belongings! AA Self Storage offers self storage in Greenville and Winterville, NC and throughout the states of North Carolina and Virginia. Our locations include Raleigh, Henderson, Wilmington, Butner, Jacksonville, Porters Neck and Oxford, NC, as well as South Hill and Lynchburg, VA.